The city of San Francisco designated ten Living Innovation Zones (LIZs) as a way to improve the Market Street thoroughfare. The Exploratorium was selected to develop the first LIZ. The City gave us space and free rein to do what we do best: experiment, try things out with the audience, and invent compelling experiences that open people’s eyes and illuminate how the world works. The innovation showcased in this first LIZ was not a product or a technology, but an attitude—it embodied the open, engaged state of mind that underlies all progress and learning. The LIZ site is 3,000 square feet of windy sidewalk near a BART train station, a coffeehouse, and a pathway to nearby museums. Most people are just passing through. The challenge was to create something that would slow people down and draw them in to engage with the space and with each other—to pause for a moment on their way down Market Street. At the heart of the installation were several interactive exhibits. They were unexpected and fun, and were designed to be used with other people—qualities that made them into great social connectors. Friends and strangers played with the exhibits together, talking, laughing, and experimenting. They watched each other closely, and sometimes even recruited and train other users. 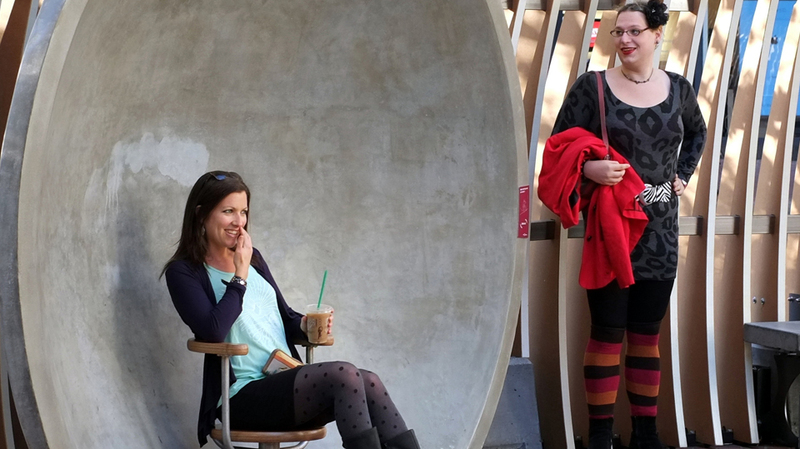 For a few moments, people came out of their shells and were open to something new. WHISPERING DISHES focus sound. People are surprised to find they can talk clearly with someone in the other dish, above the din of the city. The dishes are based on an original exhibit by artist Doug Hollis that has been a favorite of Exploratorium visitors for years. 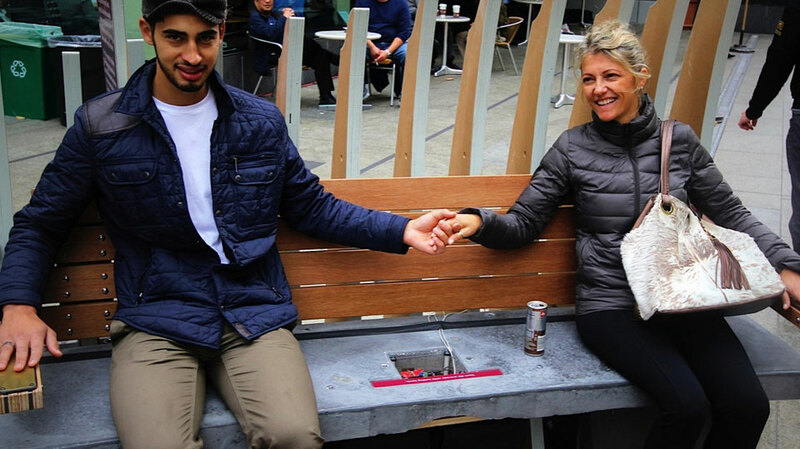 MUSICAL BENCH plays intriguing tones when users complete an electrical circuit by holding hands. Created in collaboration with our Tinkering Studio. Whispering Dishes are profiled on local radio project Audiograph. We continue to witness interesting interactions happening around the Whispering Dishes. This portable exhibit travels throughout the Bay Area. Fitting into two parking spaces, it brings the science of skateboarding to urban neighborhoods.